Hess Cemetery, Conestoga Twp., Lancaster County, Pa.
A special thank you to John R. Hess Sr. (1883-1967) of Quarryville, Pa. who for many years maintained the Hess Family Graveyard. To read more about John R. Hess and his efforts, click here. A thank you to Dave "Neighbor Dave" King for his assistance and use of his truck in this project. July 16, 2001 - On this date I had the pleasure of accompanying a group of fellow Hess's and Hess descendents around to several "Hess Historical" sites in Lancaster County. One of the places we stopped to tour was the former David Hess homestead located just west of the intersection of Sickman's Mill Road and Sandhill Road in Conestoga Twp. David Hess (1784-1873) and his first wife Magdelena Boyer built the home (a stone farmhouse) in 1850. 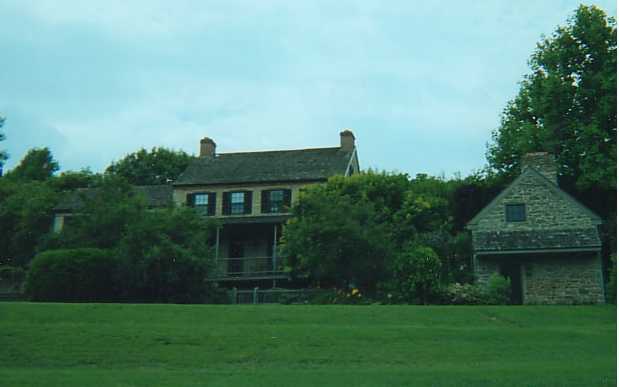 The home was built on the same land that was willed to David Hess by his father David Hess, [Sr.] (1746-1815). The home, barn and other out buildings have all been beautifully restored and are well maintained by the present owners. After touring the home we then directed our attention to a hill that directly overlooks the homestead. On this hill it was reported we would find the old Hess Family cemetery. 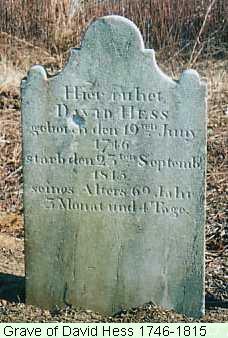 The cemetery when last visited by some of the members in our group was reported to have contained about 50 gravestones, including the graves of David Hess [Sr.] his wife Anna (Keeport) Hess. In addition most of David and Anna's children, and even some of their grandchildren are also buried there along with some friends and neighbors. David Hess Farm Cemetery, July 2001, this is what we found, or all we could find in July during our tour of the David Hess Homestead, in Conestoga Twp. Once we arrived on the hill we were surprised to find the site heavily overgrown with vines most of which was Poison Ivy, briar bushes, tall grass, and even small trees. 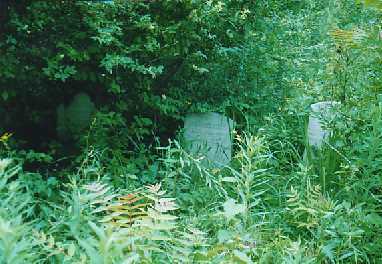 In fact it was so overgrown we were not able to initially observe any trace of the cemetery. After diligently searching the area for about 15-20 minutes we finally were able to locate a gravestone. In all we found only 3 stones that day. It was obvious that this site had not been maintained for some time and was in very great need of some maintenance. It was then I made the commitment to return in the Fall to uncover and free the old cemetery from the jungle that had consumed it. Once I received permission from the present owners to proceed with the clean up, I began to recruit family members to assist me with the project. In September my wife and I scouted out the site and were able to identify the 4 corners of the cemetery. I also visited the Lancaster Mennonite Historical Society and found some old pictures of the cemetery as well as several older listings of who had been buried there. 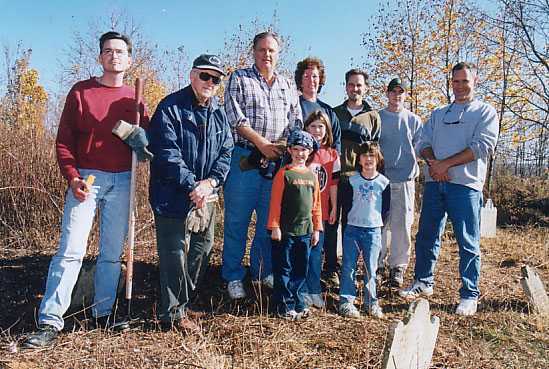 November 10, 2001 - On this beautiful (unseasonably warm) fall day a group of Hess's and other Hess descendents converged on the cemetery and began clearing away the various forms of underbrush and other vegetative growth. It was not too long before the old cemetery was again basking in the sunlight of that warm November day. Forty-nine gravestones in all were uncovered. 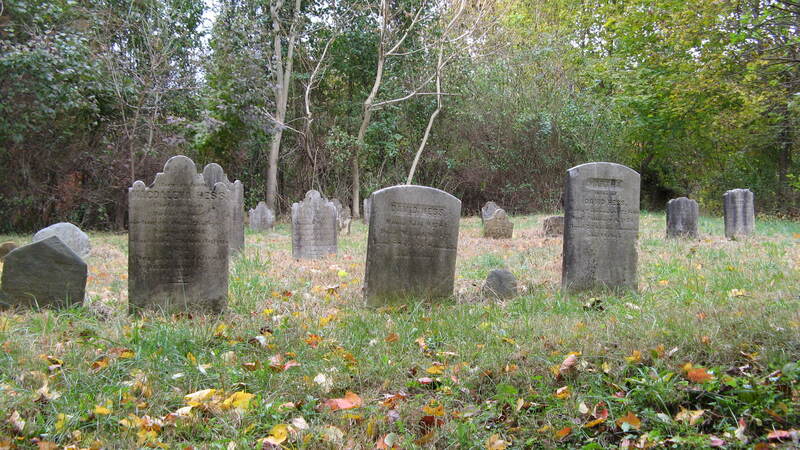 Some of the gravestones where just simple fieldstones on which no visible marking were noted, while others were engraved but no longer legible. Some of the stones were still upright, while others were badly leaning. Only two had fallen over and one was badly entangled in the roots of one of the trees. Of those that were still legible several were inscribed in German, including the gravestones of David Hess [Sr.] (1746-1815) and Anna Keeport (1751-1835). David Hess [Sr.] was the son of Michael Hess and the grandson of Hans Hess. It was Hans Hess who had come from Switzerland to Pennsylvania in 1715-17 and had settled in nearby Pequea Twp. David Hess [Sr.] had become an owner of a large amount of land (over 200 acres) in the "River Corner" area of Conestoga Twp. It has been reported that David Hess [Sr.] had several farms there. He and his wife Anna Keeport had 10 children including four sons (Daniel, David [Jr.], John, and Michael), and six daughters, (Barbara, Nancy, Elizabeth, Fronica, Maria, and Susanna). When David died in 1815 he had in his will that the land be divided up follows; Michael received 72 acres, John a farm and 91 acres and the majority of the land (110 acres) including the home plantation was willed to his son David (Jr.). The land that David [Jr.] received is the same land that the 1850 stone farmhouse and cemetery are located on today. David [Sr.]s son Daniel had previously received his share prior to the will. The work continues. 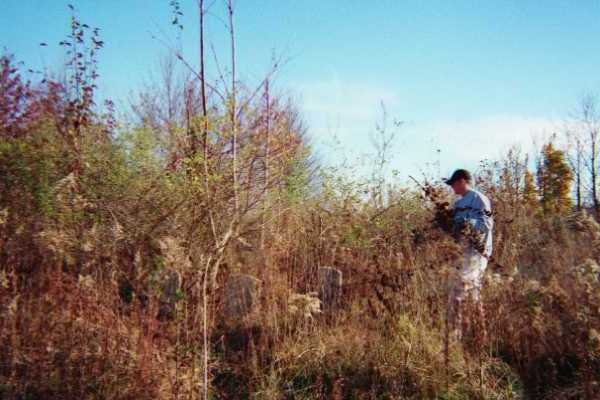 Steven Hess of Enola, clearing brush away from the David Hess Cemetery (11/10/2001). David Hess [Jr.] , was born in July of 1784, and had been married twice, first to Magdalene Boyer (1786-1843), and second to Martha Lipp (1800-1873), all three are buried in the cemetery. It has been reported that David Hess [Jr.] died in 1873 he had put in his will that the cemetery and the drive to the cemetery be given to Hess descendents forever. Help arrives from Connecticut (Ben F. Hess, IV and Family) 11/10/2001. 5. Marian (Eshleman) Schreiner, great x5 granddaughter of David Hess through his son John (1785-1823) , the father of Anna (Kauffman) Hess. 7. Rosalie Hess, wife of Benjamin F., III. 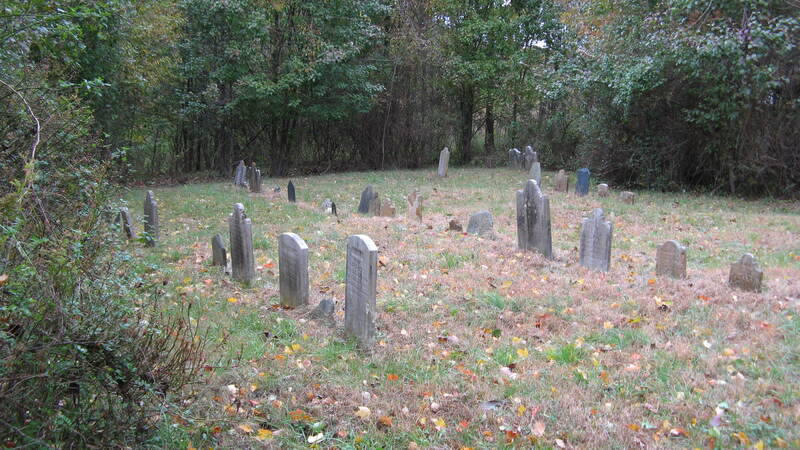 Here is a group shot of some of those who helped clean up the cemetery. The gravestone in front is that of their ancestor John Hess (1785-1823). From left to right; Frank Hess, Edward K. Hess, Ben F. Hess III, Marian Schreiner, Chris E. Hess, Steve A. Hess, Ben F. Hess IV, and the three girls in front are Karen Katelyn McLeod, Megan Rose Hess, and Kathryn Mary Hess. 9. Mary Ellen Hess, wife of Benjamin F. Hess, IV. 13. Michael F. Hershey (brother-in-law of Frank Hess), and the official photographer of the David Hess Family Cemetery Project. For many of us in the group it was the first time we had met one another, having only conversed through emails after having "found" one another online while doing genealogy research via the internet. 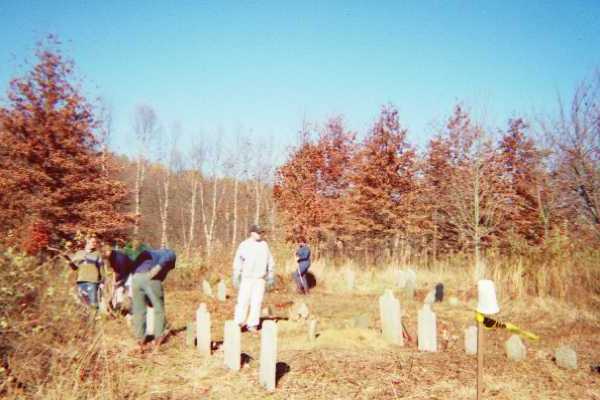 Work completed for 11/10/2001, David Hess Farm Cemetery. 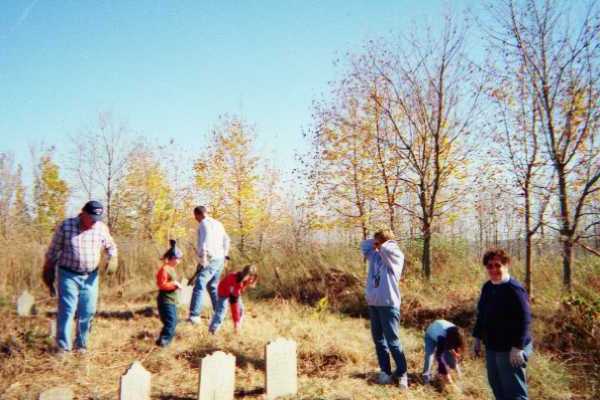 The cemetery project is not done, in fact we are planning to continue the work in the Spring of 2002. Ongoing will be the maintaining of the site, (weeds cut down) and the resetting of some of the stones that are badly leaning. Long-term plans are to look into the possibility of having a fence or stone wall built around it and a memorial marker with a dedication to David Hess [Sr.] and all his descendents. 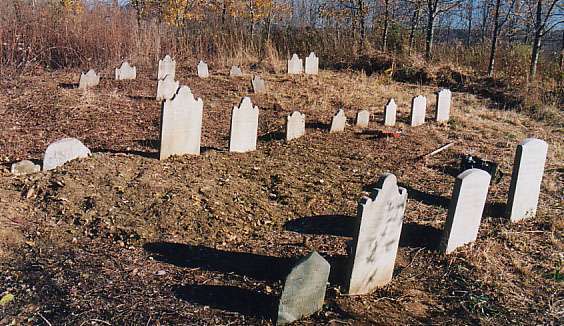 The following stones were identified and recorded following the clean up of the cemetery on 11/10/2001. A = row one from left to right and, B. C. and D are rows 2, 3, and 4 from front to back. Loc. Name DOB DOD Age Additional information & Relationship to David Hess Sr.
A13 Martha (Kreicer Lipp) Hess Sep 22 1800 Jan 6 1873 72 3m 14d Second wife of David Hess Jr. (1784-1883) Daughter of Jacob Kreider (1777-1845) & Susanna Miller (1799-1839). Martha's first husband was Christopher Lieb Lipp, d. ca. 1836. B10 Anna Zercher Jan 1 1818 Dec 27 1820 German Script - Daughter of Heinrich Zercher & Anna Shoff. Granddaughterof David Hess, Sr.,& Anna Keeports. B11 Jacob Zercher March 22 1822 Sept. 13 1825 German Script. Son of Heinrich Zercher & Anna Shoff . Grandson of David hess, Sr. & Ann Keeports. B14 David Hess Sr. Jun 19 1746 Sept 23 1815 69y 3m 4d German Script. Son of Michael & Barbara Hess and the husband of Anna Keeports. 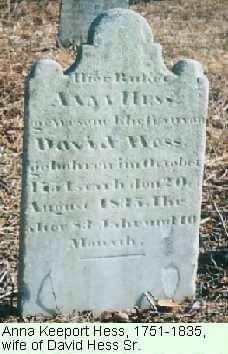 David's grandparents (Hans & Magdalena Hess were 1717 immigrants to what is now Lancaster County, Pa.
B15 Anna (Keeport) Hess Oct 1751 Aug 20 1835 83y 10m German Script. Wife of David Hess Sr. and daughter of Daniel Keeports & Anna Groff Kreider. B17 Infant son Hess 12 days Infant son of Christian Hess & Elizabeth Haverstick. 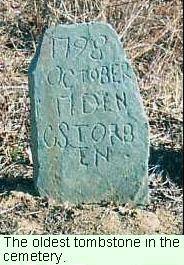 C2 David Hess 1795 October 17, 1798 Den C storden. Field stone with German Script. C4 M.D. 1804 31 10m 4d Slate: Might be for a Michael Derendinger, son of John Derendinger & Barbara Hess. C6 A. K. Might be a stone for Anna (Hess) Kauffman, daughter of Daniel Hess & Magdalena Ament. D1 Elizabeth (Hess) Gall July 25 1781 Sept. 22 1861 80 1m 26d Wife of Jacob Gall & the daughter of Samuel Hess (1785-1819) & Anna Martin (1760-1822) Niece to David Hess, Sr.
D7 Catherine Kaufman Aug. 14 1819 Sept. 6, 1836 17y 0m 23d German Script: Believed to be the daughter of Johannes Kauffman & Anna Hess. D9 Johann Kauffman Jul 19 1788 Apr 19 1839 German Script: Married to Anna Hess. Note on stone states, "born in village of Kauffman, Manor Township, Lancaster County, Pennsylvania" He was the son of Joseph D. and Mary Kauffman. 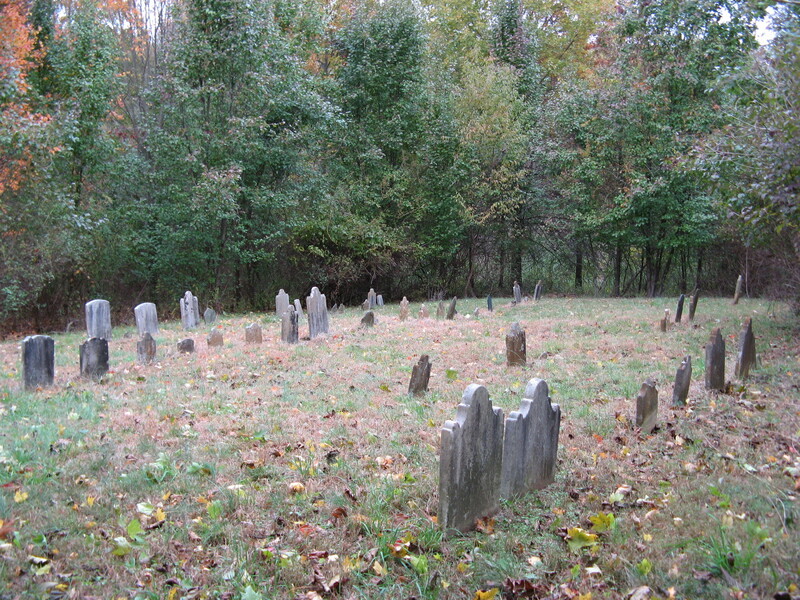 Following are the names of the ten (10) people who where previously recorded as being buried in the graveyard (as per the records found in the files at the Lancaster County Historical Society and the Lancaster Mennonite Historical Society). At present these gravestones appear to be either missing or are the ones no longer legible or only have an inscription of initials on them. On September 12, 2004 my son Steve & I decided it was time to pay a visit to the David Hess Cemetery. Not having been to the cemetery since July 3rd I was not too surprised to see that the grass had grown to about 2 to 3 feet in height. The cemetery was last cut back on June 11th. When last there is July my wife and I had treated the ground with a herbicide. 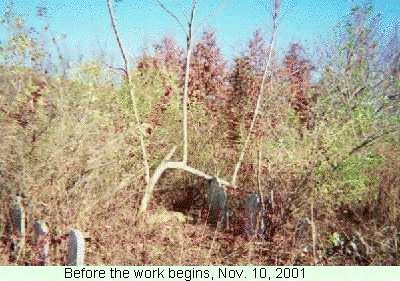 Despite the significant growth of grass, gone was the poison ivy, sumac and other brush type plants. The herbicide has obviously helped. Steve and I were able to knock it down with a power weed whacker and then cut it further with a small lawn mower. Afterwards I spayed the ground (especially around the stones) with another light dose of herbicide. Overall it continues to look pretty good. We will return later in the fall once there has been a heavy frost or two to re-cut it and rake it out.